The economy and terrorism are the top two issues for voters this fall. Overall, 84% of registered voters say that the issue of the economy will be very important to them in making their decision about who to vote for in the 2016 presidential election; slightly fewer (80%) say the issue of terrorism will be very important to their vote. In 2008, far more said the economy would be very important to their vote (87%) than the issue of terrorism (68%). Other issues that rank highly on voters’ 2016 importance list include foreign policy (75% very important), health care (74%), gun policy (72%) and immigration (70%). With an open seat on the Supreme Court, 65% say appointments to the nation’s highest court will be a very important factor in their decision this fall. About as many (63%) say the issue of how racial and ethnic minorities are treated will be very important to their vote. Fewer than half of voters see abortion (45%) or the treatment of gay, lesbian and transgender people (40%) as very important to their vote. Among Trump supporters, 90% call the economy very important to their vote and 89% say the same about the issue of terrorism. Other issues given high priority by Trump supporters include immigration (79%) and foreign policy (79%). Large majorities of Clinton supporters also see the economy (80%) and terrorism (74%) as very important issues to their vote. Another top issue for Clinton supporters is how racial and ethnic minorities are treated: 79% of Clinton supporters say this is very important to their vote compared with just 42% of Trump backers who say the same. Clinton backers are somewhat less likely than Trump supporters to say immigration will be very important to their 2016 decision (65% vs 79%). Comparable shares of Clinton (74%) and Trump (71%) supporters say the issue of gun policy will be very important to their vote. In 2012 and 2004, far fewer supporters of either the Republican or Democratic candidate said the issue of “gun control” was very important to their vote. While the environment ranks relatively low among all voters as a 2016 issue, Clinton supporters are much more likely to say it is very important to their vote (69%) than are Trump supporters (32%). Similarly, more Clinton (54%) than Trump (25%) backers say the issue of how gay, lesbian and transgender people are treated will be very important to their 2016 decision. Across age groups, there are varying perspectives on the importance of issues in voting decisions. 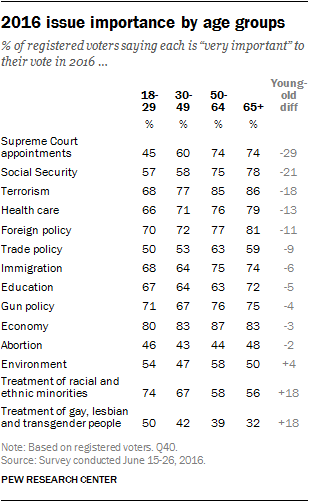 Older Americans are much more likely than younger adults to say the issue of Supreme Court appointments and Social Security will be very important to their 2016 decision. About three-quarters of those 50-64 and 65 or older (74% each) say court appointments will be very important, compared with 60% of those 30-49 and just 45% of those under 30. On the issue of Social Security, 78% of those 65 and older and 75% 0f those 50-64 say this will be very important to their 2016 decision, compared with 58% of those 30-49 and 57% of those 18-29. Large majorities of those 65 or older (86%) and 50-64 (85%) say terrorism is a very important issue to their vote; somewhat smaller majorities of those ages 30-49 (77%) and 18-29 (68%) say the same. Younger adults place greater importance than older adults on two issues: The treatment of racial and ethnic minorities and the treatment of gay, lesbian and transgender people. About three-quarters of those under 30 (74%) say the treatment of minorities is a very important issue to their vote, compared with 56% of those 65 and older. The issue of how gay, lesbian and transgender people are treated is a lower-tier issue across groups, but those under 30 (50%) are more likely than those over 65 (32%) to say it will be a very important issue in deciding how to vote this fall. While a number of top issues, such as the economy, have been rated consistently high over the course of last several election cycles, immigration is an issue that has grown in importance. In the current survey, 70% of registered voters say immigration is very important to their vote for president in 2016, up from 41% in September 2012 and 54% in May 2008. The increase in importance given to immigration has occurred among both Republicans and Democrats – though Republicans have consistently been somewhat more likely than Democrats to call it a very important issue to their vote. Overall, 77% of Republican and Republican-leaning voters and 65% of Democratic and Democratic-leaning voters say immigration is very important to their 2016 decision. Four years ago, 47% of Republicans and 37% of Democrats said this. In 2008 (when the issue was more salient to voters than in 2012), 64% of Republicans and 46% of Democrats said immigration was a very important issue in their vote choice. Conservative Republicans and liberal Democrats are both more likely than other members of their respective parties to call the issues of Supreme Court appointments and abortion very important to their 2016 decision. About three-quarters of conservative Republicans and Republican leaners (77%) say the issue of Supreme Court appointments will be very important to their vote, compared with fewer (56%) moderate and liberal Republicans and leaners. Similarly, among Democrats and Democratic leaners, more liberals (69%) than moderates and conservatives (57%) see court appointments as very important to their 2016 vote. The same pattern is seen on the issue of abortion: 47% of conservative Republicans say abortion is a very important issue to their vote in 2016, compared with 31% of moderate and liberal Republicans. About half of liberal Democrats (52%) say abortion will be very important to their 2016 decision; 42% of conservative and moderate Democrats say the same. When it comes to which candidate would do the better job handling key issues, voters give the edge to Clinton over Trump in several areas, including making wise foreign policy decisions and dealing with immigration. But while Clinton is seen as having the edge over Trump on a greater number of the issues included in the survey, Trump holds a narrow advantage over Clinton when it comes to improving economic conditions and defending the country from future terrorist attacks – two issues voters place near the top of their importance list. Voters overwhelming say Clinton would do a better job dealing with race relations than Trump (66% vs. 26%) – the widest issue advantage for either candidate. Clinton also holds a wide advantage over Trump when it comes to the candidate who could better reflect voters’ views on abortion (53%-30%) and deal with health care (54%-37%). By almost 20 points, more voters say Clinton would be better at making wise foreign policy decisions than Trump (54%-36%). On the issue of immigration – an area where Trump has made a series of controversial comments – 51% of voters say Clinton would do the better job compared with fewer (42%) who say Trump would do better. With a current vacancy on the Supreme Court, 52% say Clinton would do better selecting Supreme Court justices, compared with 40% who think Trump would have the better approach. On trade policy, an issue that featured prominently in both parties’ primary campaigns, neither candidate enjoys a significant advantage: 48% of voters say Clinton would do better making wise decisions on trade compared with 46% who say Trump. Similarly, no candidate has a significant edge on gun policy – an issue that has received renewed attention in the wake of the nightclub shooting in Orlando, FL: 46% of voters prefer Clinton’s approach on guns, while 45% prefer Trump’s approach. By a 48%-43% margin, Trump holds a slight edge over Clinton as the candidate voters say would do the better job improving economic conditions. On terrorism, Trump has a similar advantage: 48% say he would do the better job preventing future attacks; 43% say Clinton would do the better job. Trump holds a wide edge over Clinton as the candidate seen as better able to reduce the influence of lobbyists and special interest groups in Washington: 50% think Trump would do the better job, while just 30% say Clinton would; 16% of voters volunteer that “neither” would do the better job reducing special interest influence in Washington. In part, Trump’s overall deficit on select issues reflects some skepticism from Republican and Republican leaning registered voters – particularly those who preferred another candidate in the GOP primary. Overall, 53% of Republicans and Republican leaners say Trump would do the better job dealing with race relations, while 36% say Clinton would do the better job and 11% volunteer that neither would or that they don’t know. Among Republicans who say they supported a candidate other than Donald Trump in the GOP primary, more say Clinton (51%) than Trump (34%) would do the better job on race relations. Majorities of Republicans and leaners say Trump would do the better job than Clinton dealing with immigration (80%) and foreign policy (70%); Republicans who did not support Trump in the primary are 28 points less likely than those who did to say he would do the better job on immigration and 33 points less likely than GOP Trump primary backers to say he would do a better job than Clinton making wise foreign policy decisions. Among Democrats, confidence in Clinton is lowest when it comes to reducing the influence of lobbyists and special interest groups in Washington. Overall, 52% of Democratic and Democratic leaning registered voters think Clinton would do the better job on this issue, while 24% say Donald Trump would do the better job and 20% volunteer that neither would. About four-in-ten Democrats who supported Clinton in the Democratic primary are not sure she would be the best candidate to reduce the influence of lobbyists and special interests: 57% say she would do the better job on this issue, while 22% say Trump would do better and 16% volunteer that neither would. Views among Democrats who supported Bernie Sanders in the primary are little different: 46% think Clinton would do the better job, while 27% think Trump would and 23% volunteer that neither would. The gaps between Democrats who supported Clinton in the primary and those who supported Sanders are wider when it comes to which candidate would do better defending the country from future terrorist attacks and improving economic conditions. On the economy, 86% of Democrats who preferred Clinton in the primaries say she would do a better job than Trump compared with a smaller majority (68%) of Democrats who supported Sanders. Similarly, nearly nine-in-ten (87%) Democrats who backed Clinton in the primaries say she would do the better job defending the country from future terrorist attacks; 60% of those who supported Sanders say the same.